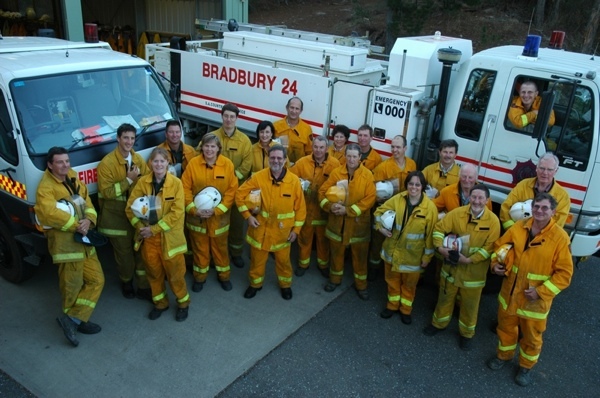 Bradbury CFS brigade is currently made up of approximately 40 members which includes both firefighters and operational support personnel. The brigade is run by a management committee which is made up of the President, Vice-President, Captain, Admin/Finance Officer and three brigade representatives elected by the whole of the brigade. The operational part of the brigade is made up of the Captain, 4 Lieutenants, 4 Senior Firefighters and approximately 20 firefighters. We are all volunteers and are on-call at any time of the day or night. We respond to a variety of incidents including; grass or bush fires, house fires, vehicle fires, road crashes, trees blocking the road, hazmat (Hazardous Materials) and any other emergency situation. We also assist the SA Ambulance Service with man-power to recovering injured persons from properties or the conversation park. We train on Monday nights (except public holidays) beginning at 7pm. We hold weekly training during roughly October through to May and fortnightly training over the winter. We also do occasional Sunday morning catch-up training sessions during the fire season. The brigade has quarterly whole-of-brigade general meetings held on the first Monday in March, June, September and December and regular social and fund-raising functions at other times. Our AGM is held in August with elections occurring every 2 years. We are always looking for new members, and not just firefighters, there are many other jobs to be done. Operational Support members assist with radio comms, catering, brigade administration, equipment checks and maintenance, general station maintenance (eg. brushcutting, sweeping, cleaning and so on). If you live in the district please come along on a monday night and have a chat and see what we do. Bradbury CFS, Proudly powered by WordPress.